Extreme Lightscapes provides Commercial Christmas Decorating, Commercial Christmas Light Installation and Christmas light show and event production for any venue with the desire to go the extra mile. We specialize in designing marketing driven Christmas events and displays for churches and ministry groups, shopping centers and retailers, municipalities and other commercial venues. Synchronized Christmas lights create an eye catching spectacle in any environment that needs to make a statement and increase traffic. Our years of experience and commitment to the lighting arts make us one of the premiere consulting, design, installation and program maintenance organizations in the United States specializing in animated Christmas lights. As such, we are available to assist in any capacity you might need – from design consultation to installation logistics, synchronized light show programming or complete end-to-end event production, Extreme Lightscapes is your one stop shop for creating the most magical holiday environment you can imagine. Our philosophy is simple; share the joy! It is this philosophy that lies at the heart of every project we take on. We know from experience that if we help you spread as much joy as possible during the holiday season and beyond, the other rewards of the effort will take care of themselves. We help you make people feel good and in turn, they stay a little longer, spend a little more, come back more often and tell their family and friends. During the Christmas season – the biggest ‘selling’ season of the year no matter the venue – Retailers are looking for ways to stand out from their competition during the race for consumer dollars. Cities, towns and municipalities are looking for new ways to attract more business, visiting shoppers and to share the joy of the season with the community. Churches are looking for new ways to gain the attention of desperate souls in need of healing and whose hearts are never more open to change than during the holidays. Today, we serve clients throughout the United States with a 100% focus on the art of computer controlled light shows and commercial Christmas decorating – all dedicated to spreading as much joy as possible during the Christmas season. Our skilled designers can create any array of unique designs that will extend your vision to embolden your environment and bring it to life – for holiday events or any other special event or occasion, any time of the year. We can create a unique setting – or simply enhance a vision you may already have in mind. Throughout the execution of your vision we can play the role of a <span>trusted adviser</span> or we can take the <span>lead role</span> in seeing your project through to fruition year after year. Our goal is to help spread the joy of the season while increasing business value for our commercial clients and creating <span>new opportunities for our church/ministry clients to spread the word</span>. Once you experience a custom display – whether it be a Christmas light show with animated Christmas lights or a special event any time of the year – we are sure that you will join our family of satisfied customers. We are a proud member of the Light-O-Rama partner network and provide full service Christmas event production, Animated Christmas Lights, Synchronized Light Shows, Commercial Christmas Decorating and Christmas Light Installation for shopping centers, amusements parks, resorts & casinos and other businesses with a desire to go the extra mile. Synchronized Christmas lighting is an attention getter in any environment that needs to make a statement and increase traffic. Our years of experience and commitment to the lighting arts make us one of the premiere producers of animated Christmas lights in the world. 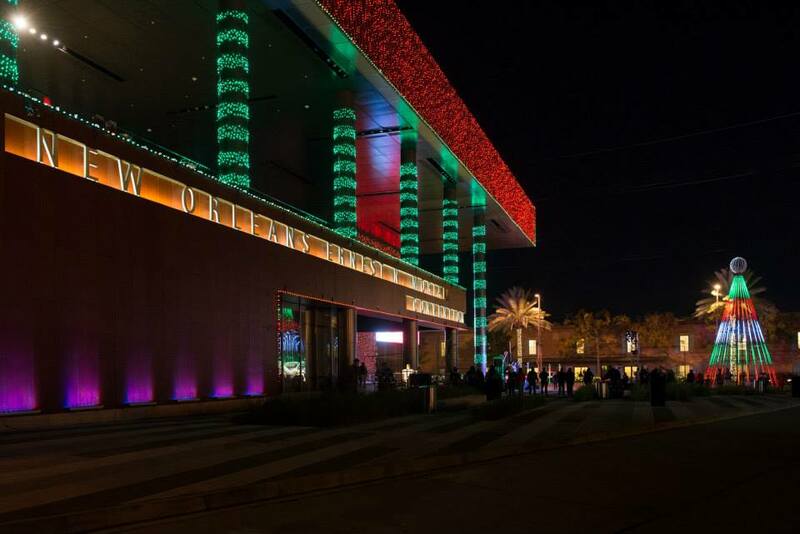 As such, we're available to assist in any capacity you might need – from design consultation to installation logistics, synchronized light show programming or end-to-end event production, Extreme Lightscapes is your one stop shop for creating the most magical holiday environment you can imagine. Our skilled designers can create any array of unique designs that will extend your vision to embolden your environment and bring it to life – for holiday events or any other special event or occasion, any time of the year. We can create a unique setting – or simply enhance a vision you may already have in mind. Throughout the execution of your vision we can play the role of a trusted adviser or we can take the lead role in seeing your project through to fruition year after year. We can help by guiding you to a successful event. We can install, maintain and support your display. Lighting, technology, and custom displays – everything you need. "Thank you for helping me with my first Christmas light show. You guys are the ‘whisperers of the lights‘"
Our goal is to help spread the joy of the season while increasing business value for our commercial clients and creating new opportunities for our church/ministry clients to spread the word. Once you experience a custom display – whether it be a Christmas light show with animated Christmas lights or a special event any time of the year – we are sure that you will join our family of satisfied customers.